This colorful salad is the perfect accompaniment to an Easter feast, and as someone pointed out, mimics the colors of the Italian Flag – well – if you discount the blue in the cheese it does… It would also go great with grilled meats. 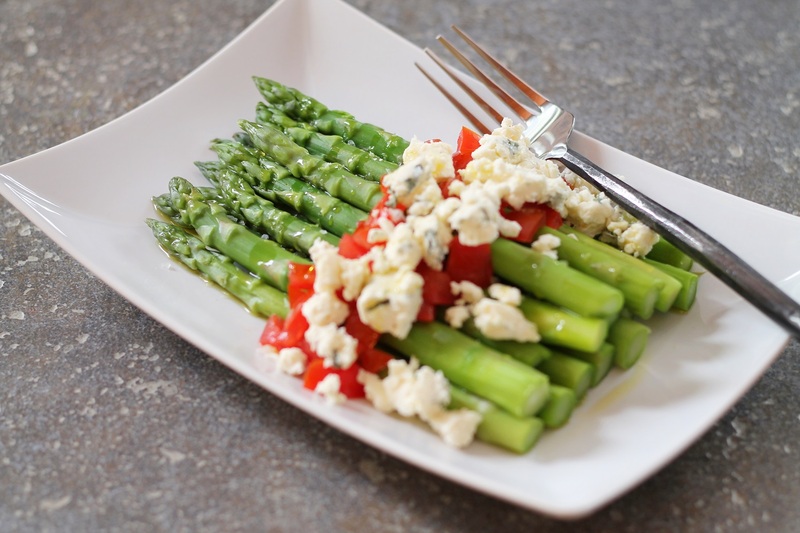 Use a steamer basket or insert in a pot for best results, you can use a little water in a covered sauce pan with no steamer insert but be sure not to over cook the asparagus. Using an ice bath after steaming keeps the asparagus bright green, and tender crisp for a toothsome salad. 2-3 small tomatoes, seeds and pulp removed then diced. Give this a try, and make it one of your favorites. Hooray! I can open your website at last. Takes a long time still, but it works! I’m hoping for a good crop of Asparagus this year, and I might make your dish. Unfortunately home-grown tomatoes are not available at the same time as home-grown (or even local) Asparagus. True Mark, they are not perfectly seasonal,but sometimes we make an exception. glad you can open the site – I’ve done a bit of sluething and am having difficulty reproducing your symptoms. Thanks! It is a nice combination.